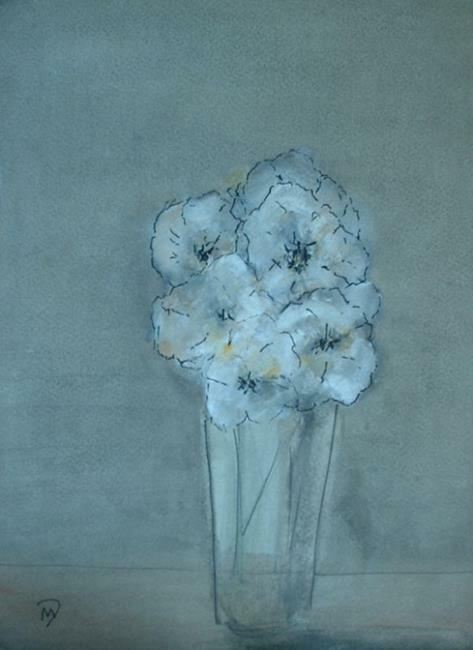 These are pale cream flowers, set against a similarly unassuming background, with loose indian ink definition on gentle watercolour, to emphasise their delicate transparency. They are cut and set in a simple vase, and I deliberately avoided the normal bright bold colour of a flower-dominating still life. Someone said the elements of the composition worked together to give a strong feeling of sadnesss. Perhaps they are, since cut flowers are ultimately dying flowers, and flowers are not always associated with the happy moments of our lives. Thought I better end on a cheerier note.